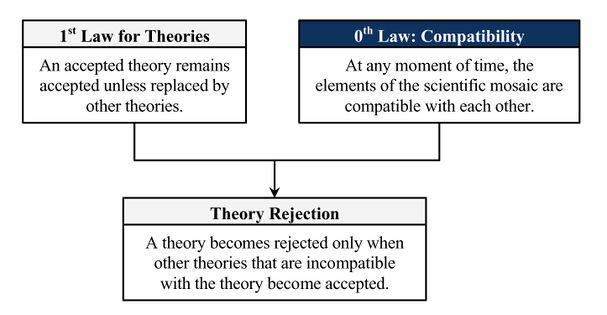 An attempt to answer the question of Mechanism of Theory Rejection which states "A theory becomes rejected only when other theories that are incompatible with the theory become accepted." Theory Rejection theorem was formulated by Hakob Barseghyan in 2015.1 It is currently accepted by Scientonomy community as the best available theory on the subject. Theory Rejection theorem (Barseghyan-2015) is an attempt to answer the following question: How do theories become rejected? What is the mechanism of theory rejection? See Mechanism of Theory Rejection for more details. It is important to note that the rejection of the axioms of a theory does not necessarily lead to the rejection of its theorems. The theorems may retain their place in the scientific mosaic after the axioms from which they are derived get rejected. Each theorem is assessed on an "individual basis by its compatibility with the propositions of the newly accepted theory."1p. 168 If it turns out that a theorem or theorems are compatible with the propositions of the newly accepted theory, they remain in the scientific mosaic. Conversely, if the theorems are incompatible with the propositions of the newly accepted theory, they become rejected as per the theory rejection theorem. a b c d ↑ Barseghyan, Hakob. (2015) The Laws of Scientific Change. Springer. This page was last modified on 13 March 2018, at 19:04.